A newborn moose calf. A fast-moving river swollen with spring runoff. 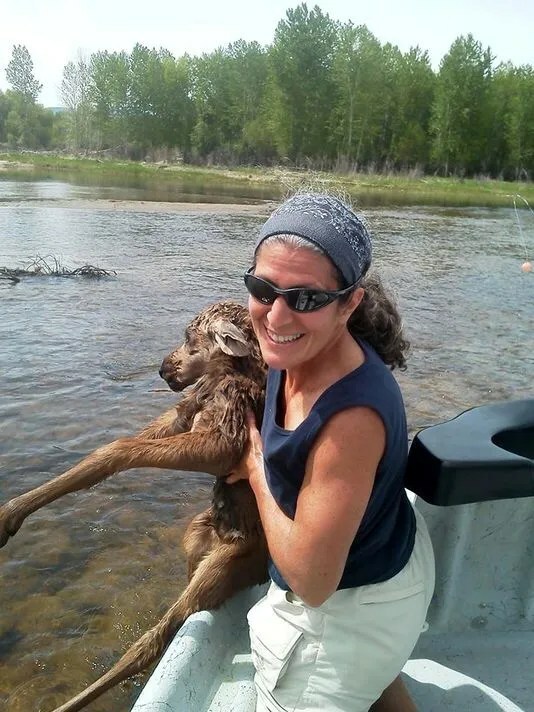 But for the presence of humans willing to intervene–a fishing outfitter and his client–the calf’s probable drowning in Montana’s Big Hole River would have passed unnoticed. Mom Moose–she herself struggled against the current–would have spent frantic moments scouring the riverbank. And because grief is not the exclusive domain of Homo sapiens, it can’t be said, categorically, that she would not have grieved the loss of her little one. Let’s turn the page on the lucky moose calf media sensation in the Big Hole River and peruse the next page on the not-so-lucky bison calves struggling–where are the media?–in the Madison River. Formed by the confluence of the Firehole and the Gibbon rivers, the Madison flows out of Yellowstone National Park swollen with snowmelt in late spring. The Yellowstone area’s shaggy, wild bison use the river valley to exit the park, as well, in search of nutritious, early spring grass at lower elevations. Moms give birth on sunny slopes and eat their fill after a long, harsh winter. But politics is a cruel taskmaster and native, wild bison aren’t tolerated on land that “belongs” to cattle (including, even, our collectively-owned public land!). Their peaceful respite is shattered when Montana’s livestock industry demands that bison be driven off their own traditional, migratory habitat–even when no cattle are present–and back into the park. Personnel from five state and federal agencies mercilessly haze the animals on horseback, ATVs, snowmobiles and with vehicles and even helicopters, running them for exhausting miles before forcing them into the swift river where calves are nearly overwhelmed in a current so strong that even grown bison struggle. Grassroots advocacy group Buffalo Field Campaign has filmed the harrowing river crossing (watch it here) along with brutal helicopter hazing (watch it here; if the tiny, injured–and doomed–calf at 1:50 doesn’t break your heart, you might not have one). I wish the 12,000+ folks who “liked” the baby moose story just as equally “disliked” the baby bison abuse (but of course, they’d have to know about it, first). After all, they have more invested in it–our tax dollars are funding the persecution. I wish they could see the irony that I see: “Our humanity” and compassion rescue one baby from a perilous river, while our greed and a market for beef drive other babies into a perilous river. Though it’s not as easy as clicking a “like” button, I wish they could take action that might actually make a difference. If just half–heck, even just a third–of those 12,000+ would send an e-mail to Montana’s governor (click and scroll to bottom) protesting this abusive wildlife action, and/or would send just a buck or two to Buffalo Field Campaign to fuel their grassroots activism (they operate on the thinnest of shoestrings), what a difference we might make! But “liking” a baby moose rescued from random danger is easy. It’s warm, fuzzy, and casts a collective glow that makes us proud of our humanity. Going to bat for baby bison intentionally put in harm’s way asks more of us individually. It demands moral certitude and effort, and perhaps reminds us that dietary choices aren’t always benign. It demands that we act to correct a wrong–not just click to express a “like.” It requires that we not just thank God for our humanity in dealing with animals, but that we actually exercise it. QUOTING KATHLEEN: But “liking” a baby moose rescued from random danger is easy. It’s warm, fuzzy, and casts a collective glow that makes us proud of our humanity. Going to bat for baby bison intentionally put in harm’s way asks more of us individually. It demands moral certitude and effort, and perhaps reminds us that dietary choices aren’t always benign. It demands that we act to correct a wrong–not just click to express a “like.” It requires that we not just thank God for our humanity in dealing with animals, but that we actually exercise it. So . . .. let’s rain. Let’s pour. Not merely with words dripping with justified praise for the savers of moose calves and with words dripping with sarcasm (speaking to myself here) toward the harmers of bison calves. But with active appreciation of good, manifest as consistent right-doing (toward the fishes, too!) and consistent efforts to end wrong-doing. I did just “click” and scrolled to the bottom and sent my thoughts and pleas to all the appropriate decision makers. I have followed the efforts of BFC for years and always supported their tenacity and impact even on a shoe-string budget. They’re worthy of admiration and better funding for sure. At the heart of it all… Is it really “wild-life” if it’s “managed”? Especially so with such profit-driven brutality? Love bison, elk and wolves? Everyone would do them a world of good by simply leaving cows off their plate! Am I being one of those little children? Are my thoughts, manifested as deeds, expressing forgiveness, meekness, gentleness, compassion — the qualities that save not just moose from drowning but also hearts made hard by killing? Thanks to you both for your comments, and to everyone who contacted the governor and/or BFC, as I know a few folks have.